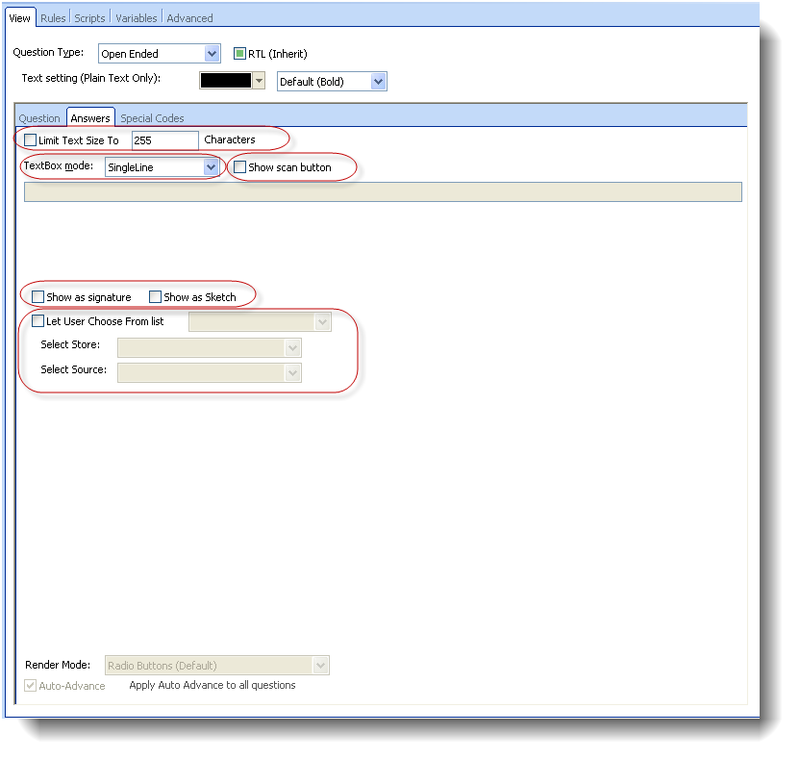 Each question has a set of tabs; each tab is used for different configurations – let's go over the tab's. 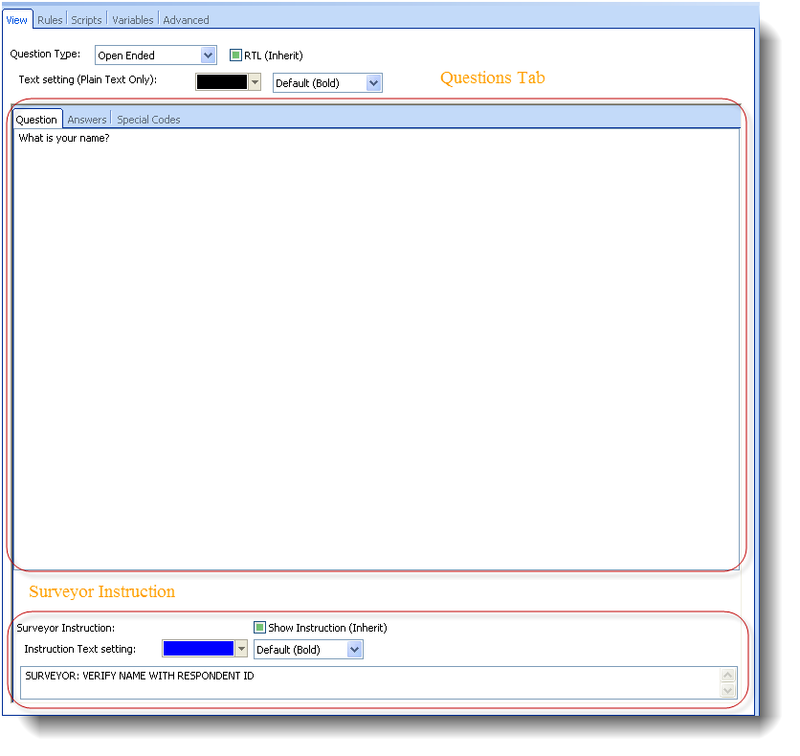 Under the question's tab, within the View tab, you can define the Questions Body Text and the surveyors instructions if any. 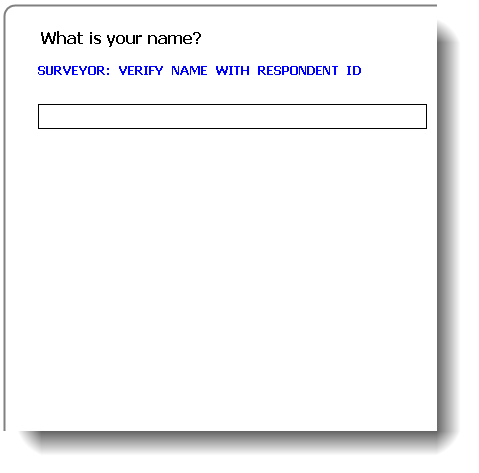 The text written in the question's tab box is the body text that will be displayed to the surveyor. 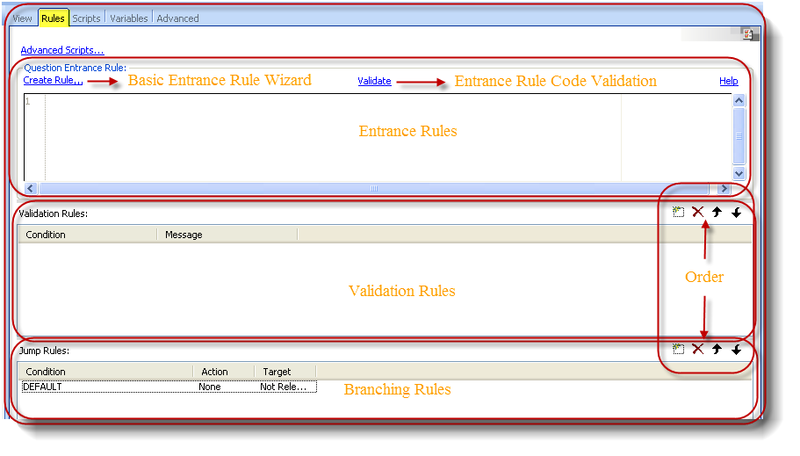 "SURVEYOR: VERIFY NAME WITH RESPONDENT ID"
The answer's tab allows you to define the questions answers, set their visual rendering, edit and configure them. 'Limit Text Size To' – allows you to set the maximum text input length. 'Show scan button' – Set's this question to behave as a QR scanner, scanning QR codes as the answer of this question. 'Show as signature' – Set's this question to be a sketch for writing a signature and saving it as an image file. 'Show as Sketch' – Set's this question to be a sketch for drawing and save's it as an image file. 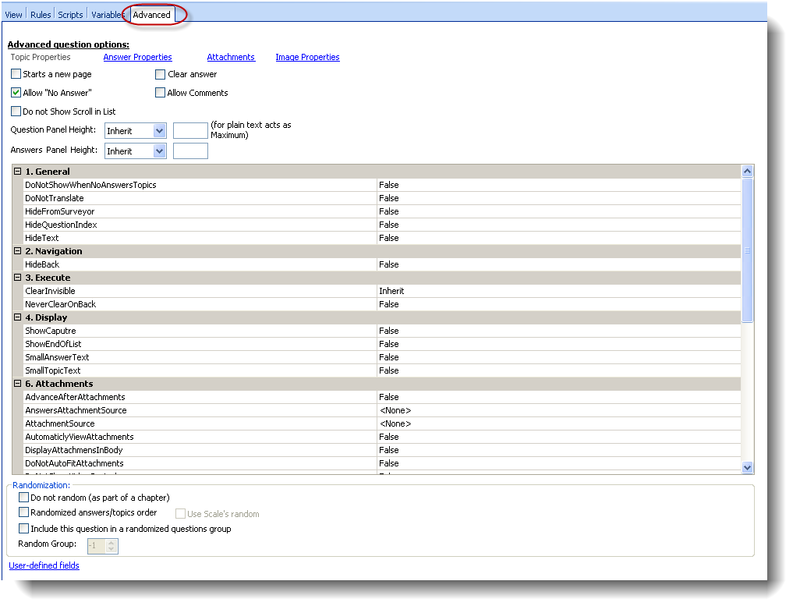 'Let User Choose From List' – For configuring this question to correspond with a given Subject Store or List source. This tab allows you to add a set of answers in addition to the open ended text field – you can select one answer from these answers, that will be exclusive and disable the text field input. 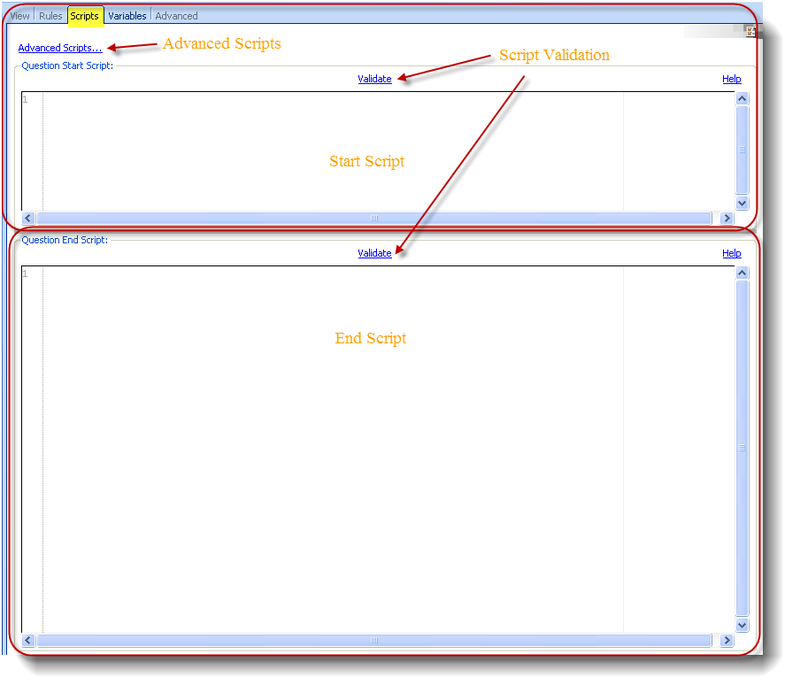 In the Script's tab you can define your questions Start Script, End Script and enter the advanced scripts for defining more complex functions. In 1st interview the 1st special code was answered, in the 2nd interview the name was given.